If You're Looking for a Great Way to Say Thank You!, How About Saying it in 140 Languages! CUPERTINO, CA (PR Buzz) – April 11, 2017 – – “Thank You” is an amazing and powerful pair of words that our parents taught us since we were young. It’s an expression of gratitude that shows how we appreciate the good deeds that we receive from others. We thank them because they are important to us. Being appreciated is one of the things that motivate us, both in life and at work. That’s why it’s important to offer a genuine “Thank You” whenever appropriate. AHAthat is happy to announce that the Amazon Kindle format of this book will be given out for FREE today, April 11, 2017, so pick up yours at: https://www.amazon.com/Thank-You-Saying-140-Languages-ebook/dp/B06XT55H3K. To see and learn how to automatically share AHAmessages from this book, you may check out this video: https://youtu.be/OsALn3AKvu8. “Thank You” is more than a phrase. It is a responsibility to pass on the love received. Another great time to say the phrase is when someone pays us a compliment. When in doubt, just say “Thank You”. Do not worry about showing too much gratitude to the people around you. There is no downside to that. In this book you will learn 140 languages in saying "Thank You!" If you want to say a special thank you, please go to http://aha.pub/ThankYouand share directly from the AHAthat platform or type in "aha.pub/ThankYou" in your or someone else’s social media status window. You'll be pleasantly surprised on what happens and the reaction you get. “Saying thank you is easy. It costs nothing, not even an effort. We say thank you for gifts, special favors, or assistance in times of need. It conveys our gratitude and shows our appreciation. That’s why it’s important to liberally use these two golden words in our daily interactions. 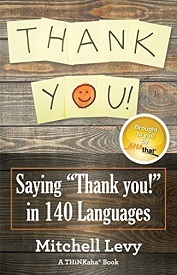 This book is great to use to say “Thank You” to people using the language that they speak no matter where they are in the world,” says Mitchell Levy @happyabout, the AHA Guy at AHAthat (http://AHAthat.com). AHAthat makes is easy to SHARE, AUTHOR & PROMOTE you. AHAthat allows you to 1) Easily build your brand by sharing others' quotes with proper attribution and 2) Show your expertise by creating your book in 8 hours or less and having others share your quotes. There are over 38k quotes from recognized AHAleaders that you can share in seconds for free. All content on the platform is curated by THiNKaha which has published over 800 physical and eBooks. THiNKaha makes it easy to create compelling content that helps turn corporate experts into recognized thought leaders. THiNKaha Services include: Curation for AHAthat, Thought Leadership Mentoring/Coaching, Book Publishing, Social Media, Traditional Media Coaching, Vetted Referrals, Producing and Repurposing Content for Shows like Thought Leader Life and many other Thought Leadership Services, including the Creation and Support of Corporations' Thought Leadership Blueprints. To have us help your corporation amplify its thought leadership, please contact Genivieve Casabuena at genivieve.casabuena@thinkaha.com or call (408) 257-3000.